Crocs Canada, online at Crocs.Ca, is your destination for crocs for all members of the family. Crocs Canada offers crocs for men, women, girls, and boys. At Crocs Canada, you can find sandals, flip-flops, flat shoes, heels, wedges, slip-ons, and boots. 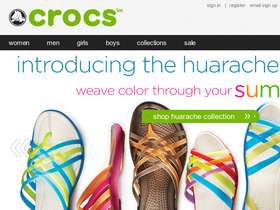 You can also purchase the new Crocband, the Fuzz Collection, and medical shoes at Crocs Canada. Clogs, sneakers, translucent shoes, Crocs Chameleons are on sale at Crocs Canada as well. RetailSteal.com has the best Crocs Canada coupon codes, Crocs Canada discounts, Crocs Canada coupons, and Crocs Canada promo codes. Shipping and handling rates at Crocs Canada depend on the pricing of your purchase and your shipping destination. Free shipping is offered for orders over $100. See website for full details. Exclusions may apply. Shop at Crocs Canada and enjoy $20 savings on orders $120+. Click here for code. Use our coupon code at Crocs Canada online today to save $10 on purchases of $100 or more. Click our link to shop now. Shop at Crocs Canada and shop 39 products under $25. Click here to shop. Shop at Crocs Canada and enjoy 38% savings on Walu Loafers. Click here to shop. Shop at Crocs Canada and enjoy 65% savings in outlet. Click here to shop. Take up to 60% off select styles at Crocs Canada when you shop online. Click link to enjoy the End of Season Sale. Shop at Crocs Canada and enjoy 44% savings on Kids Mammoth Evo Clog. Click here to shop. Get free shipping when you spend over $24.99 at Crocs Canada. Click link for savings.